Information is generally a good thing, especially when it comes to something as important as paying attention to what we eat. Yet sometimes too much information can be paralyzing, getting in the way of simply making better choices. I recently had the honor of publishing an article in the September issue of the T.Colin Campbell Center for Nutrition Studies, titled Skip Calorie Counting. Eat a Plant-Based Diet & Enjoy! If you subscribe, then perhaps she’s already come across your desk. Yet if you don’t subscribe, no need to miss out! Here is the article opening, and the link to read the complete article on the Nutrition Studies.org website. Whether you are a veg-food veteran or just taking your first steps on the plant-based journey, there are more resources and research support than ever before for making the switch to plant-based. Yet it can also present some challenges to transition due to the ‘too many choices’ phenomenon. With increasing popularity of vegetarian, vegan, and whole food, plant-based eating, the variety of opinions about the ‘best version’ can lead to confusion, frustration, and even abandonment of your quest to eat better. Is it time to get back to plant-based basics? To cut through the clutter and get what you are looking for – better health, reduced environmental impact, more compassionate eating – is it time to simply get back to plant-based basics? First, let’s look at how too many choices can derail your journey. Then, we’ll underscore some plant-based basics so you can easily get back on track. Skip Calorie Counting. 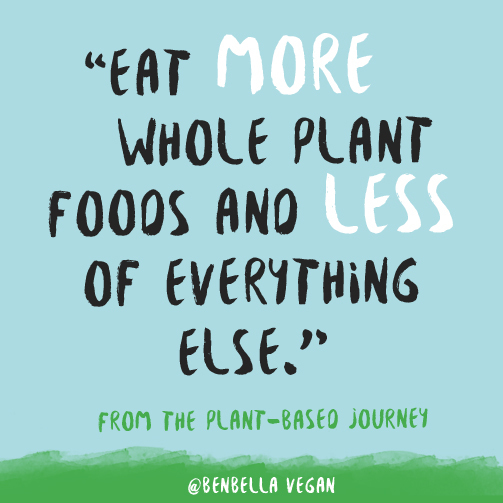 Eat a Plant-Based Diet & Enjoy!